This hot shot burst out of nowhere during a friendly matchup at the Hopman Cup today in Australia. Nick Kyrgios and Jack Sock are good pals, and were visibly having fun in an exhibition match Sock won handily, 6-2, 6-2. While No. 13 Kyrgios has the higher ceiling—maybe the highest ceiling of anyone in tennis right now, if he could be bothered to pursue it—Sock, ranked No. 23, boasts a curious, dangerous weapon. Both men have huge, whippy forehands, but Sock’s might be the most heavily-spun groundstroke in the game. 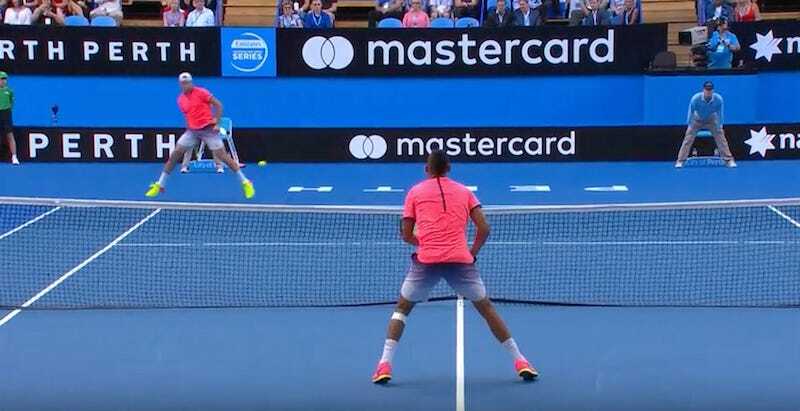 It’s almost unpleasant to watch Jack Sock hit it. Look at all that wrist.